A jig is a jig is a jig...To a lot of anglers jigs aimed at walleye and pike fishing are all pretty much the same. To the elite 10% of the angling community that routinely catches 90% of the fish, special purpose jigs represent an edge in angling worth taking a closer look at. 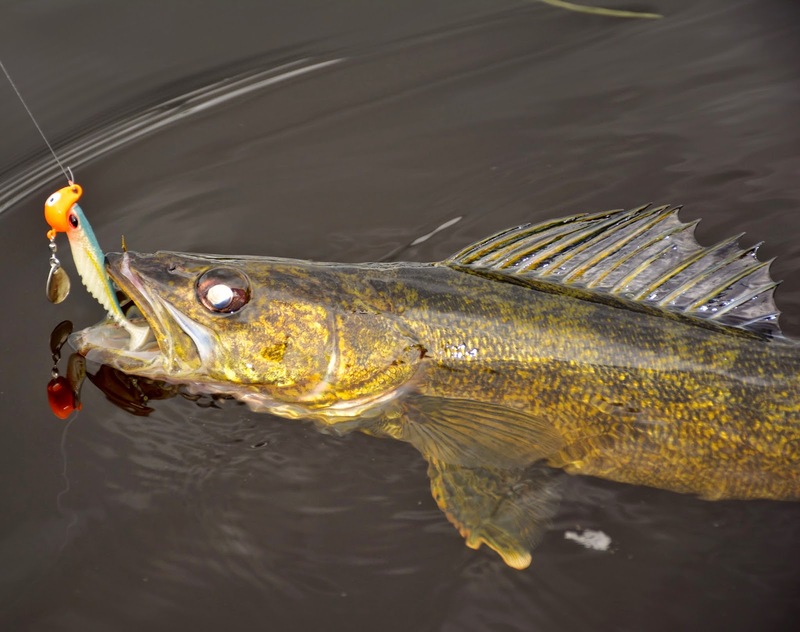 If walleye and pike fillets are what’s for dinner, then it’s important to learn a little about modern jig design and how these designs can help put more fish in the boat. For those anglers targeting pike and walleye, special purpose jigs are as essential to the tackle list as a fishing rod, reel and line. All fishing jigs have some features in common, but a growing number of jigs are designed for specific fishing presentations. The round head jig favored by so many anglers may be the “classic favorite”, but t jigs these days come in a host of different head shapes and designs that allow them to be more efficient fishing tools. Anglers that embrace these advancements in jig fishing strategy will find success less fleeting on the water. 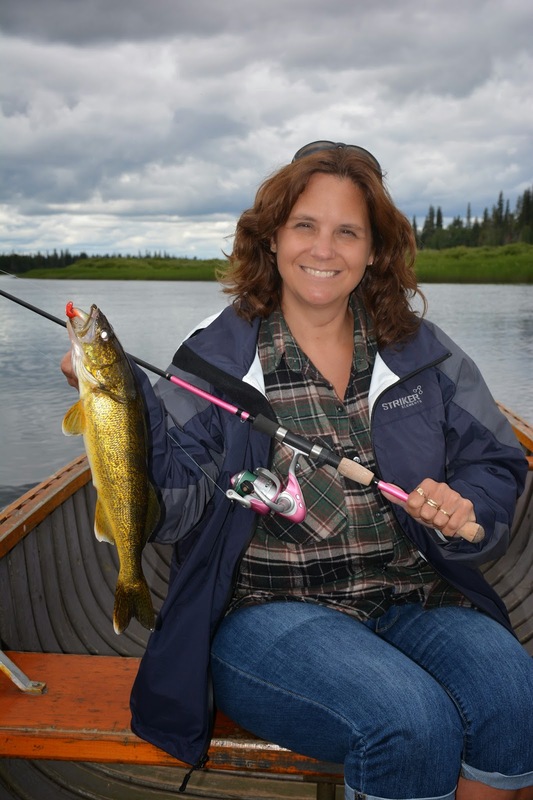 A number of walleye jig designs fall into a category I’ll call special purpose jigs. Within this larger category are a number of smaller categories such as “attractor jigs”, “swimming jigs”, “weedless jigs” and “stand-up jigs”. is ideal for pitching larger soft plastic grubs. Attractor jigs are distinguished by their ability to create flash which in turn attracts fish. Flash is created in a number of ways but the most common methods are to attach either a prop style blade to the hook shank or a flipper blade to a swivel molded into the bottom of the jighead. The flash these jigs put out is modest, but an often important element in generating bites. Attractor jigs tend to shine (no pun intended) best when fishing in stained to dirty water conditions. The extra flash helps in making these baits more visible to fish and in turn the benefits are more bites. Rivers are a good example of a fishing situation that cries out for attractor jigs because river waters tend to be more turbid than natural lakes. The most common sizes of attractor jigs are 1/4, 3/8 and 1/2 ounce models. Swimming jigs are baits that are designed to be casted and retrieved, swimming the bait in the lower 1/3 of the water column. Most jigs in this sub-category feature a streamlined head design or what is known as a 60 degree eye-tie (line attachment point) that comes out the nose of the jig. The combination of using a streamlined head and a 60 degree line tie enable these jig designs to literally snake through rocks, grass and other cover amazingly well. Swimming jigs are best paired up with soft plastic grub bodies that are durable enough to stay on the jig. Common sizes in this jig category include 1/16, 1/8 and 1/4 ounce models. Weedless jigs take the special purpose jig category to even higher levels. These jigs are designed with either a wire or fiber weed-guard that allows the jig to be fished in exceptionally dense weed cover or submerged wood and rocks. Weedless jigs tend to feature the 60 degree eye tie feature and to keep them as snag free as possible these jigs are normally compact in size and shape. The most common sizes of weedless jigs for walleye fishing are 1/16 and 1/8 ounce models. Stand-up jigs are yet another sub-category of special purpose jigs that are especially useful. Various head designs are employed to create a jig design that positions the hook point at about a 45 degree angle to the bottom. Having the hook point up off the bottom dramatically reduces snags and creates a jig that has a much higher “hooking ratio” than traditional jig designs. Stand-up style jigs are a top choice for fishing the bottom and this jig design can readily be used with soft plastics or live bait. The most common sizes of stand-up jigs for walleye fishing are the 1/8, 1/4, 3/8 and 1/2 ounce models. 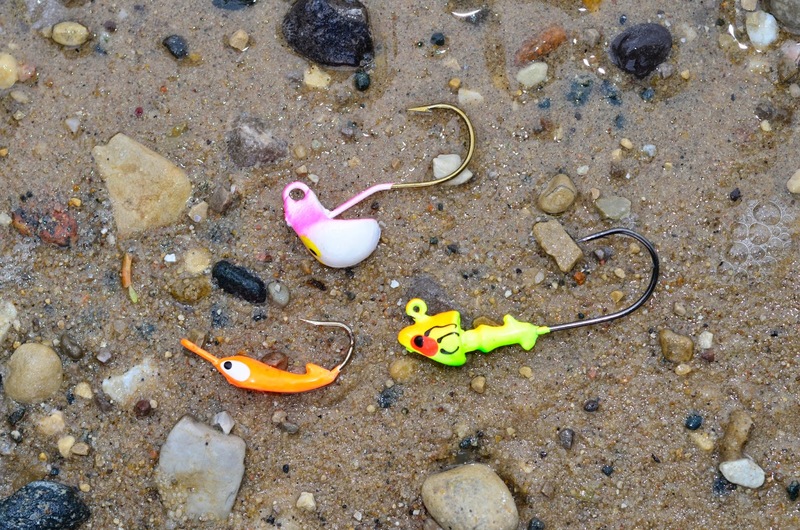 larger plastic grubs popular among pike anglers. Jigs ideally suited to pike fishing require a little more “functionalism” than the typical fishing jig. 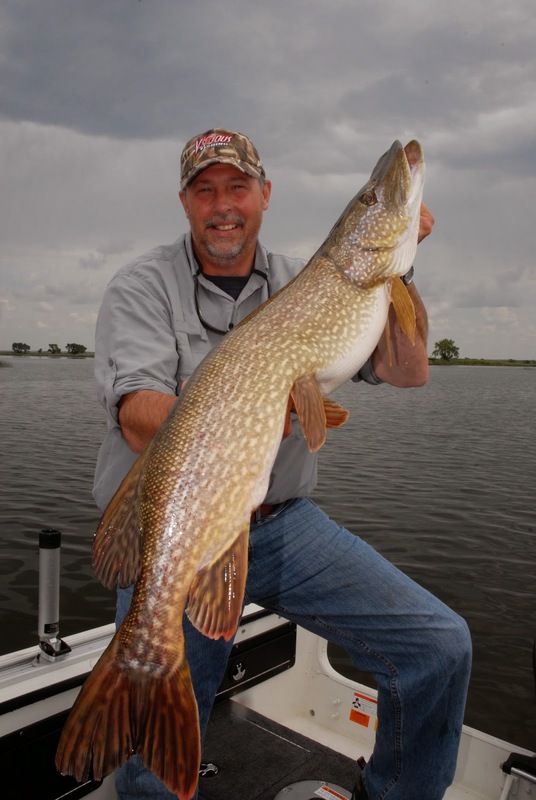 Because pike are powerful fish and also because anglers use heavy lines when fishing pike, the hooks on the typical lead head jig are not adequate. Good pike jigs feature stout hooks that do an excellent job of bulldogging stubborn fish out of heavy cover. Also, a good pike jig has a larger hook gap suitable for dressing these jigs with the larger soft plastic bodies commonly used in pike fishing. Some of the jigs that function best for pike fishing are actually saltwater designs, made for targeting species like redfish. These saltwater jigs have large and tempered hooks well suited to pike fishing and the head designs are ideal for casting and retrieving in heavy cover. The most common size saltwater style jigs suitable for pike fishing are the 1/8, 1/4 and 5/16 ounce models. Weedless jigs are another important tool in the pike fisherman’s bag of tricks. Because pike are so often found in heavy weed cover, fishing a jig with an exposed hook can quickly become frustrating. Weedless jigs similar to those designed for bass “flippin” in heavy cover are ideal for pike fishing applications. The most common sizes of weedless jigs for pike fishing are 1/4, 3/8, 1/2 and 3/4 ounce models. Jigs are fishing tools and special purpose jigs are highly refined fishing tools. Embracing modern jig design is an easy way to refine the craft of jig fishing while putting more pike and walleye in the boat.